1. Night Blossom – Pongu Pongu – One of the most popular locations in all of Walt Disney World is the brand new area Pandora – The World of Avatar. This otherworldly location brings guests to the Valley of Mo’ara where the mythical Na’vi people live. Guests can wander underneath majestic floating mountains, enjoy two absolutely amazing attractions, and also check out a great quick service location that serves up unique drinks and small bites inspired by the culture of the Na’vi and the beauty of the area. Pongu Pongu translates to “party party” in the language of the Na’vi and guests who stop there simply must enjoy a delicious Night Blossom. This colorful beverage combines layers of apple and desert pear limeade which are then topped with passion fruit boba balls. 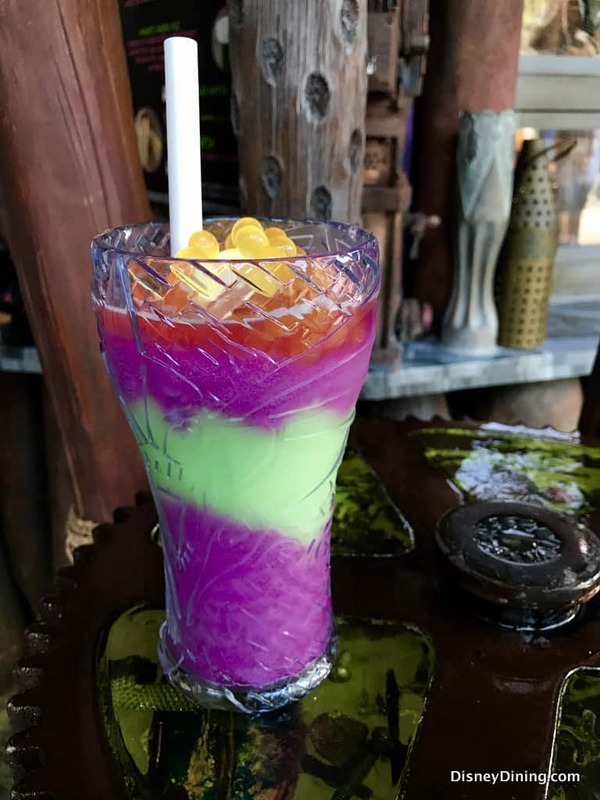 Guests can choose to order the Night Blossom in a regular cup or in a souvenir mug and they can also opt to pay a few dollars more for a Glowing Unadelta Seed that makes the drink even more otherworldly and beautiful!